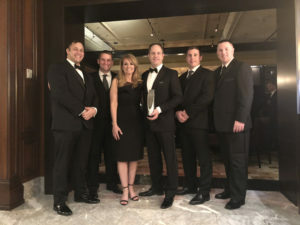 Representatives from the Northern Virginia and Central Maryland office accept the NAIOP Norther Virginia Award of Excellence for our Ashburn Crossing project in Ashburn, VA.
ASHBURN, VA (November 21, 2018) – St. John Properties, Inc. captured the Award of Excellence from NAIOP Northern Virginia in the R&D/Industrial/Flex category for Ashburn Crossing, an 81-acre mixed-use business community located in Loudoun County, Virginia, in the commercial real estate trade association’s annual Best of NAIOP Northern Virginia Awards program. At final build-out, Ashburn Crossing will contain more than one million square feet of commercial office and amenity space. NAIOP Northern Virginia’s “Focus on Excellence” Awards program recognizes significant new and renovated contributions to Northern Virginia by the commercial, industrial and mixed-use real estate community. This year’s program presented awards in the Interiors, Membership, Transactions and Building categories. 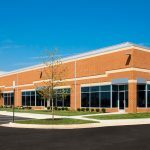 Located at the intersection of Loudoun County Parkway and Gloucester Parkway, Ashburn Crossing presently includes six, single-story R&D/Office/Flex buildings totaling approximately 215,000 square feet of space. Offering 16 to 18 foot clear ceiling heights and abundant free parking, each building has been designed to achieve LEED Gold certification. Ashburn Crossing employs an innovative approach to landscape irrigation by using safe, non-potable reclaimed water supplied directly from Loudoun Water. 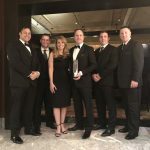 “This award competition is extremely competitive each year and our entire team takes enormous pride in the selection of Ashburn Crossing as the best industrial business community in the Washington, D.C./Northern Virginia region,” stated Matt Holbrook, Regional Partner for St. John Properties. St. John Properties, Inc., founded in 1971, owns and has developed more than 19 million square feet of Flex/R&D, Office, Retail and Warehouse space in Maryland, Colorado, Louisiana, Nevada, Pennsylvania, Virginia, Utah and Wisconsin. 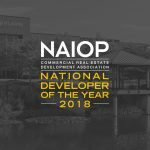 The company was named the national “2018 Developer of the Year” by NAIOP, the Commercial Real Estate Development Association. For more information about the company visit www.sjpi.com.